WHAT'S NEXT FOR THE CONTINENTAL DOLLAR? In recent years, several researchers have delved into the coin deeply, now with the Internet making searches easier. 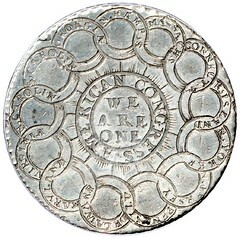 It turns out that not a single reference in print has been found about metal 1776 Continental dollars in circulation in America at that time or any time later! I found this amazing. The more I read, the more I learned. It seems that electronic treasure detectorists have found countless metal buttons, coins, and the like in various places in the United States from that era, but not a single metal Continental dollar. 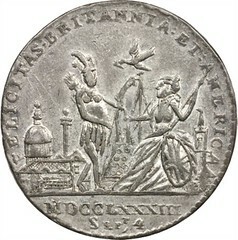 However, such coins were for sale as medals in London before 1790! There is much more fascinating new information. If you would like chapter and verse on some of this research, much is on the Internet site eSylum. Christopher McDowell, editor of the Journal of Early Numismatics (new name for the Colonial Newsletter published by the American Numismatic Society) is gathering all of the new finds and will be preparing an essay on the coin. 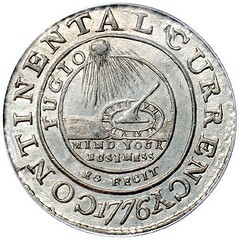 Hope springs eternal as they say, and if any Mint News Blog readers can find any citations for pewter (or tin) 1776 Continental dollars published before 1780, let me know! The challenge presented in NEXT STEPS FOR CONTINENTAL DOLLAR RESEARCH in the E-Sylum issue of July 15th was to find a die maker with the initials of E.G. who may have been working in the 1780’s in England or Europe. I turned to my copy of Erkla¨rung der Abku¨rzungen auf Mu¨nzen der neueren Zeit, des Mittelalters und des Alterums, by Schlickeysen. This book has explanations of the abbreviations used on coins from the Middle Ages to the mid 1800’s. On page 129 was the entry E.G. und E.G.F. and the mintmaster’s name – Elias Gervais, along with where he worked and dates. He was a diecutter / mintmaster in Cologne from 1750-1777. The initials he used were EG and EG·F . Examples of his initials can be seen on the Cologne thalers of 1759 (EG·F Davenport 2175), 1762 (EG Davenport 2177), and of 1777 (EG Davenport 2181). His initials also appear on other coins of Cologne and Trier. This led to looking at images of the German coins with the E.G. initials and searching the internet for information about this mintmaster. None of the coins with E.G.F. had the word the F. stood for. A Google search turned up the nomisma.org page that equated the F. in E.G.F. 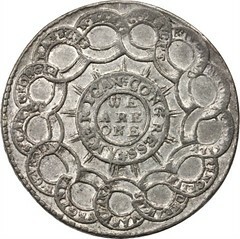 with FECIT (meaning: he made it), as is found on the Continental Dollar. F. was used after the initials of other mint-masters but none of them started with E.G. 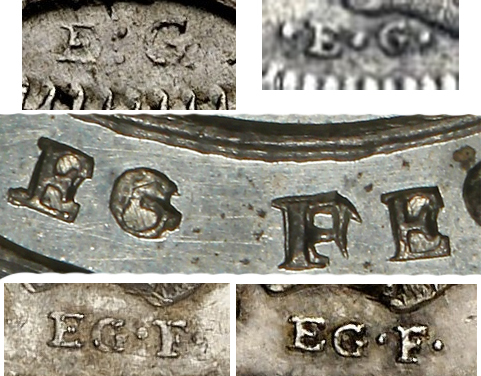 I made the compilation above which shows the initials from each photo above placed above and below the initials from the CONTINENTAL CURRENCY coin. Note the styles of the letters are very similar, but the letters are not duplicates of each other. There is nothing new about trying to connect this medallist with the initials E.G. on the piece of American Continental Currency, as it was tried in 1923! I looked on the Newman Numismatic Portal for more information on Gervais, but only found the Forrer reference. He apparently hadn't been mentioned as a possible connection to the Continental Dollar elsewhere, at least not in American numismatic literature. 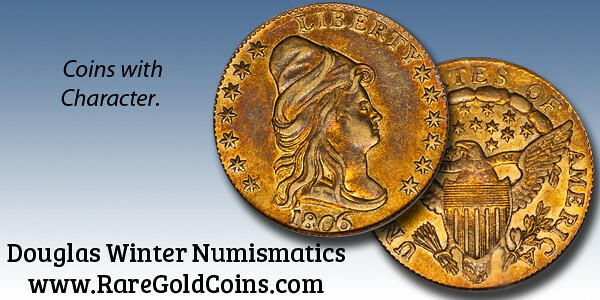 Just be aware that contrary to popular belief the portal doesn't contain everything ever written in American numismatics - it's still far from it and will never be complete. It's possible other references will turn up someday.